It only takes a couple of minutes to prepare breakfast – cereals are very quick and convenient, as are cold cuts or boiling an egg. But why not add a bit of variety to your breakfast routine by taking inspiration from your fellow Europeans and trying different kinds of breakfast from across Europe? We’ve listed two that we particularly like – why not give them a go yourself when you have the time? You’ll taste the difference! 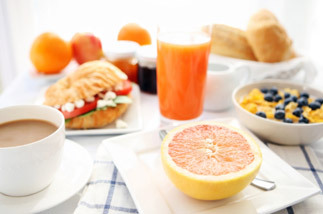 Bread and breakfast cereals are rich in carbohydrate which supply your body with long-lasting energy. Strawberries are a great source of fibre, vitamin C and manganese – all essential nutrients for good health. Wholegrain breads and cereals, and the dried fruit, are excellent sources of fibre. Fibre is important for supporting bowel health and heart health. Herring is a good source of long chain omega-3 fats which support heart health. Start the day with orange juice, which provides vitamin C and folate. Juices with pulp tend to contain powerful antioxidants called flavonoids. Antioxidants mop up the free radicals that contribute to chronic diseases. Fruit juice, fruit, vegetables, and fortified breakfast cereal all contribute greatly to the daily recommended intake for vitamins, minerals and fibre. Eggs are a good source of protein, while tomatoes are a rich in an antioxidant called lycopene.